A Carnival of Wonders: Dope Dining’s Cannabis Infused Dining Experience! 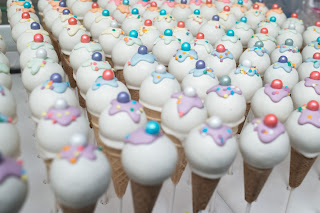 On last Friday, Edible Skinny was lucky enough to attend our first Dope Dining Experience. 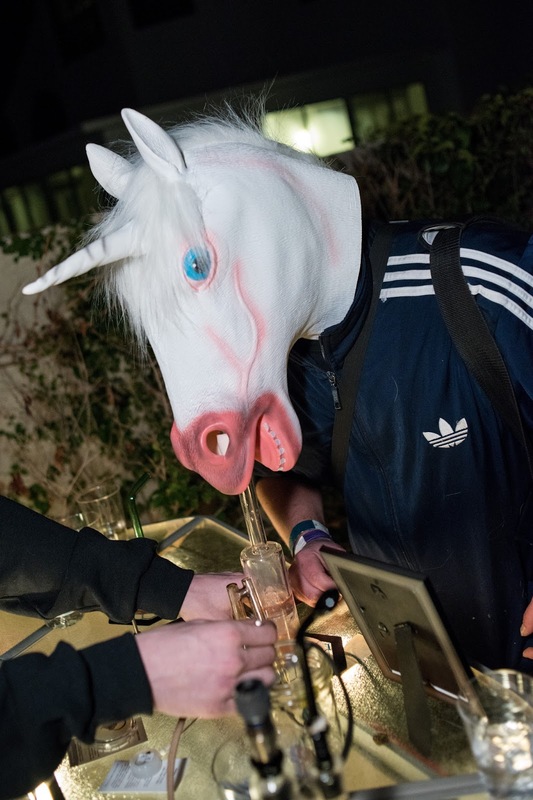 The event, was a cannabis infused Carnival dining experience that was a kickoff to the Las Vegas’ HIGH TIMES Cannabis Cup (and in our humble opinion, was much better than the actual cup itself)! Dope Dining’s second all-inclusive infused experience was celebrated by YouTube stars such as Silenced Hippie, cannabis industry leaders, and marijuana enthusiasts. The night was filled with infused sweet and savory treats, Carnival style entertainment (much of it unicorn themed as one of the night’s sponsors was the cannabis based PR company Social Media Unicorn), and live music. Fun is a dish best served elevated, as patrons were able to enjoy sweet and savory edible treats crafted by Dope Dining private chef Marysia such as: White Chocolate Infused Bacon Topped with Magical Sprinkles, Empanadas with Infused Apples and Cinnamon, and Buttermilk Fried Chicken & Waffles Served with an Infused Maple Syrup. product, was developed as a tribute to the long-standing love affair people across the globe share with coffee. This edible sativa shot contains the energizing power of caramel perfectly paired with the calming effect of vanilla and the percolating flavor of freshly roasted Arabica beans. 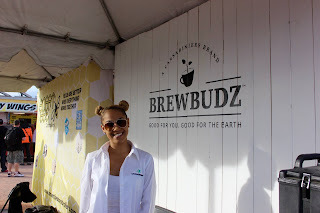 Another notable brand featured at Dope Dining’s Carnival was the San Diego based B. 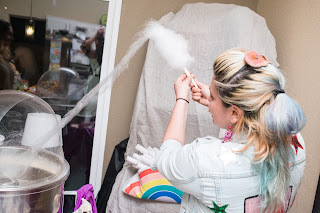 Edible, offering out infused cotton candy spun live during the event. B. Edibles’ childlike wonder confections are made with organic ingredients and infused with lab-tested CO2 solvent-less extractions. Whimsical flavors include Rose Petal, Juicy Watermelon, and Lavender. Non-edible delights offered at the Carnival included a full service dab and flower bar, infused chair massage, face painting, a tarot card reader, and caricature artist. 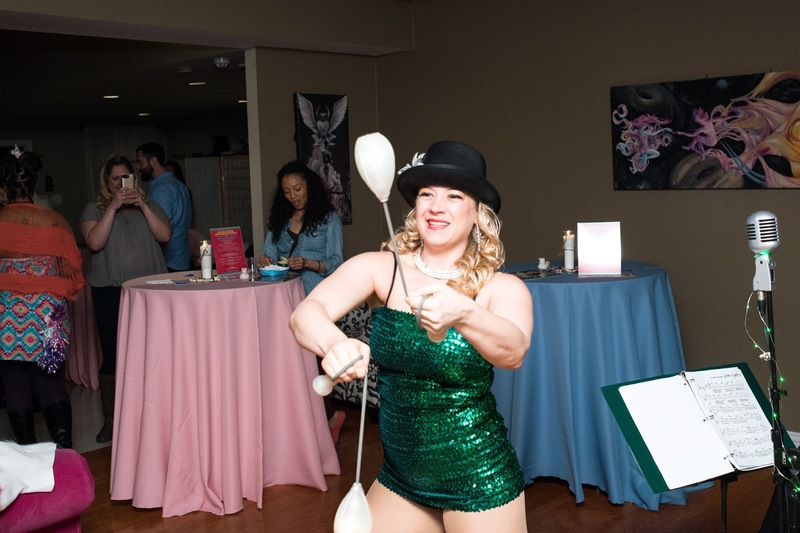 Live singers and specialty artists were provided by the Las Vegas/Los Angeles based vintage cannabis cabaret company: The Green Light District. Be forewarned, infused dining events are not for the uninitiated. Knowing your dosing limits is a must. The commonplace edible phrase, “start low and go slow” should be practiced as it is very easy to consume higher levels of THC than usual with delectably infused food. Remember that edibles normally take anywhere between 20-40 minutes to take effect. Although it might sound counter intuitive to most dinner parties you’ve been to, make sure to eat before you attend an infused dining event. Empty tummies make the effects of cannabis happen quicker and in a more intense manner, so make sure to nosh on that apple before going. But don’t get paranoid when it comes to infused dining. If you happened to be overmedicated and need to counteract the psycho-activity of THC all you need to do is utilize CBD. A few drops of CBD oil will take you out of your head and bring you back into your body. And, naturally, make sure to drink plenty of water. So if you find yourself invited to one of Dope Dining’s exclusive infused dining experiences make sure to attend. Infused dining is an experience not to be missed, on any plane. Here’s to life being delicious and to fun being a dish best served elevated! The Cannabis Cup festival, sponsored by marijuana magazine HIGH TIMES, has been held annually since 1988 in Amsterdam. Smaller versions of the event have made its way to the U.S. this decade in marijuana-friendly states such as Washington, California, Oregon, Colorado and Michigan. This was the first year the event was held in the state of Nevada. Day One of the 2017 HIGH TIMES Las Vegas Cannabis Cup presented with Ultra Health kicked off on Saturday with waves of cannabis industry leaders, and marijuana enthusiasts. It was estimated nearly 15,000 attendees and 250 vendors from about 15 countries attended the event, 10,000 tickets were sold in the past week alone. 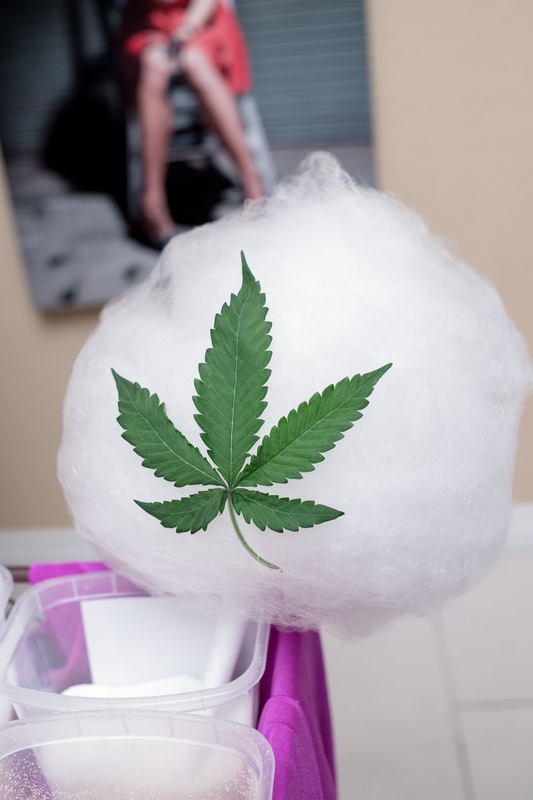 In other words, the event restricted all event goers from using marijuana in any form, at an event which has gained popularity for allowing attendants to sample cannabis provided by exhibitors and vendors. This lead to some people nicknaming the event the “no-cannabis Cannabis Cup.” It was rumored that over one third of the vendors dropped out of the event after that ruling. Others altered their planned experience to still participate within the restrictions. 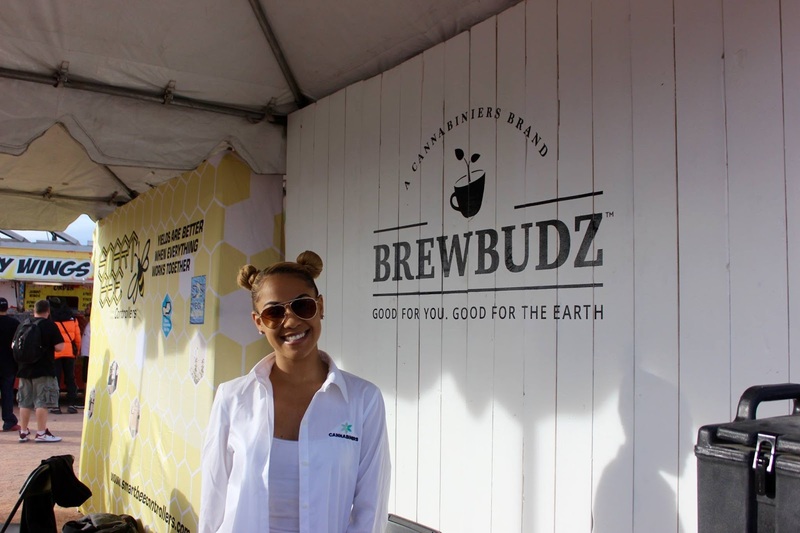 For example the Los Angeles-based marijuana edible and topical lotion company Honey Pot Bear, whose free massage area at the Cup went from a THC topical lotion (which helps reduce inflammation and swelling) to non-THC versions of their lotion. Honey Pot Bear, who has sold the lotions and pot-spiked wildflower honey in previous festivals in California, sold only T-shirts and company merchandise on Day One. Regardless of these first day hindrances Edible Skinny still had a blast! There were cannabis connoisseurs and vendors from all over the country attending this event. The non-THC massage we partook in was simply fabulous (a shout out to Moses for his mad hand skills!) And although the event was officially dry, there were many a flower being passed around discretely. 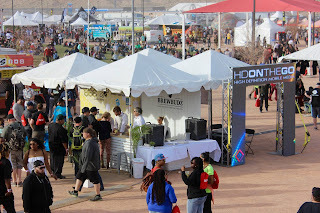 But, to add insult to injury Day Two of the HIGH TIMES Cannabis Cup was cancelled due to strong winds in the Las Vegas valley. Steady winds were expected to reach 40 miles per hour, with gusts up to 60 miles per hour. The Moapa Paiutes’ contract with HIGH TIMES calls for semi-annual versions of the festival to be held through 2019. This is estimated to bring in a combined $3 million in revenue to the tribe, said William Anderson, former Moapa Paiute chairman and current tribe spokesman. In an effort to appease anyone let down by the event, organizers are offering passes to the upcoming Southern California Cannabis Cup in April to anyone who bought a ticket for the Las Vegas Cup. Here’s to life being delicious and to future recreational cannabis festivals not being as dry as the Moapa Paiute tribal land desert!